Choose a diameter that easily slips over the shoelace. If the fit is too snug, the tubing won't be able to shrink as much, resulting in a flimsy aglet. I generally use about 4 mm (5/32") or 5 mm (3/16"). Heat shrink tubing contracts inwards to about half its diameter or less, but doesn't contract lengthwise, so cut a short section the same length as the aglet you require – about 15 to 20 mm (1/2 to 3/4 inch). Slip the tubing over the end of the shoelace; it may help to "twist" it on to avoid fraying the shoelace. If shortening a shoelace, it's easier to slip the tubing over the existing aglet before cutting to length. A heat gun is normally used to shrink the tubing, but you can also hold it a little way above a flame, taking care not to burn the tubing or shoelace. As suggested by Sue K, gently clamping the tip with a travel-sized hair straightening iron for about ten seconds gave great results. 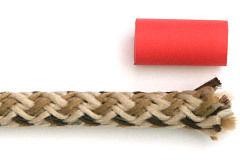 Although red heat shrink tubing was used above (for contrast), clear tubing produces aglets that are almost identical to the factory-made originals, albeit slightly flexible. This is actually an advantage because they don't split. Combining several colors, with a clear overlay for security, is a great way to display the colors of your country, school or sporting team! If you are shortening a shoelace to length, you may find that a clear heat shrink tubing aglet is a close enough match to the original aglet that you only need to do the cut and replace on one end. In this case, shift the lacing through the shoe so that one end is the desired length and all of the excess length has been shifted to the other end, then shorten just that one end and add a heat shrink tubing aglet. Heat shrink tubing is primarily meant for electrical insulation, and isn't really designed to hold securely under extreme forces. Pulling a shoelace out through a tight eyelet can therefore pull off a loosely applied heat shrink tubing aglet. For extra security, I've found that heat shrink tubing can be taken through two stages: In the first stage, applying heat will shrink the tubing to a smaller diameter just as it was designed. Carefully applying more heat will take it to a second stage where it just starts to melt and bond to the shoelace. It's tricky to apply just the right amount of heat, as too much will cause the heat shrink tubing to either burn or split, and if the shoelace is synthetic it could melt or deteriorate as well. With clear tubing, the ideal moment is when the underlying whiteness of air gaps starts to disappear as the tubing and shoelace begin to bond together. Otherwise, watch for the surface of the tubing starting to turn shiny. Either way, immediately remove the heat if the end starts to curl or if there is any sign of smoke. Another alternative is heat shrink tubing with a glue layer inside (often called "Dual Wall"). This can be distinguished by gently squashing the empty tubing and "hearing" the tacky interior as the sides separate. This glue layer results in a more secure aglet that is also firmer and less flexible. On the downside, the thickness of the aglet can be a problem if your shoe has very small eyelets, plus the tacky interior makes it much more difficult to slide over the end of the shoelace. Yet another alternative is to cut some thin slivers off a hot glue stick and to feed them with the shoelace into the tubing. The slivers of glue will melt while the tubing shrinks, so watch out for hot glue being squeezed out the ends of the tubing! You can also squeeze a couple of drops of an "instant" cyanoacrylate glue – such as "Super Glue" or "Krazy Glue" – into the end of the tubing after shrinking. Note that the fibers of the shoelace provide a huge surface area, which can cause this type of glue to cure too quickly. This may give off some nasty fumes, so beware! As suggested by Eric A, in order to combat the slight flexibility of heat shrink tubing aglets, try inserting a piece of rigid wire into the tip of the shoelace prior to shrinking the tubing. Suitable wire includes solid brass wire (available at hobby shops), unstranded picture hanging wire, a length cut from a paper clip, even a very thin nail. Heat shrink tubing comes in a range of sizes and colors and is available from electronic or electrical suppliers (ie. places that supply electricians with switches, wires, circuit boards, components, etc) or from some auto parts stores.